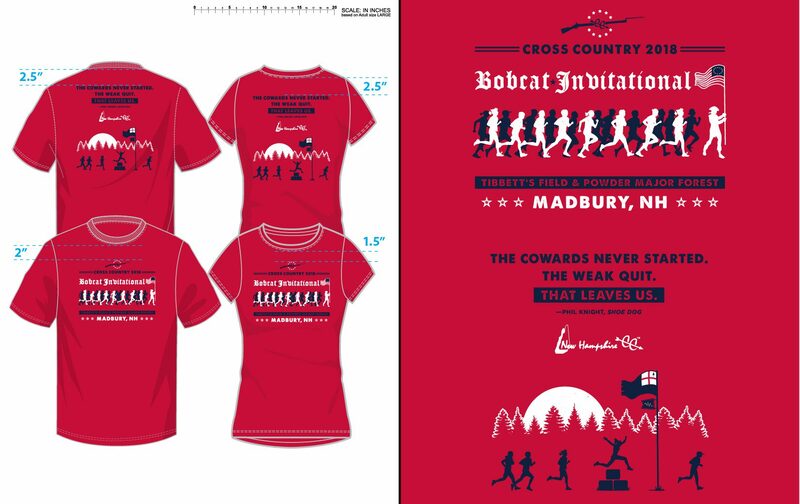 There’s some major cross country firepower gathering in Madbury on Saturday – and we’re not referring to the Revolutionary War muskets used to start the races at the Bobcat Invitational hosted by Oyster River (That’s real gunpowder, and those things are LOUD!). And yes, there will be hay bales! More than 600 athletes from 26 schools are expected from Division 1, 2, and 3. Teams attending are: Division 1’s Dover, Spaulding, and Winnacunnet; 13 schools from Division 2 including ConVal, Goffstown, Hanover, Kennett, Kingswood, Lebanon, Merrimack Valley, Milford, Oyster River, Pembroke, Sanborn, Souhegan, and St. Thomas Aquinas; and 8 schools from Division 3 including Belmont, Campbell, Epping, Hopkinton, Portsmouth Christian Academy, Monadnock, Newmarket, and Trinity. Also making the trip to Madbury are Fitch High School of Groton, Connecticut, Phillips Exeter Academy, and Tilton Prep. The meet takes place at Tibbetts Field and the Powder Major Forest in Madbury. The super spectator-friendly course runs through the old farm once owned by John DeMeritt (1728-1826). Back in 1774, inspired by Paul Revere’s ride to Portsmouth, a group of Seacoast patriots raided Fort William & Mary in New Castle and made off with some 100 barrels of gun powder. Some of that powder ended up stashed somewhere on DeMeritt’s property, and that powder is said to have supplied the patriots at the Battle of Bunker Hill the following year. Whatever the precise facts, Demeritt went down in history as the Powder Major. Much of his farm recently went into conservation through the Society for the Protection of New Hampshire Forests, which is permitting this meet. Girls JV run at 10; boys JV at 10:40; girls varsity at 11:20; and boys varsity at noon. GIRLS: Eight schools that qualified for last year’s Meet of Champions are coming. This includes three of the top 6 ranked teams in New Hampshire this year: defending D-2 champ Souhegan (#2); Con-Val (#4), and Oyster River( #6). There’s also reigning D3 Champ Campbell and last fall’s D-3 runner-up, Hopkinton. You know the Phillips Exeter Academy team will be good. Add to that mix 2017 Meet of Champions qualifiers Hanover, Milford, and Monadnock making the team competition will be very strong. The Con-Val senior trio of Rachel Hurley (who won the Korcoulis meet a week ago), Schuyler Michalak, and Clare Veverka should be in the lead pack. Belmont’s Alice Riley is coming off a strong race at Hollis last week, where she finished one spot ahead of Milford’s Lauren Robinson, who is the top returning runner after placing fifth at Bobcat last year. Souhegan’s always deep squad is led by Arielle Zlotnick and Marissa Romano. Other individuals to watch include Merrimack Valley freshman Sophia Reynolds, who broke 20 minutes to win the season-opening rust-buster meet on this same course two weeks ago. PCA’s Liza Corso, Hopkinton’s Cailey Stockwell and Emma Rothe, Campbell’s Cassie Hemming, Hanover’s Leila Trummel, Sanborn Avery Scully, and Monadnock’s Delaney Swanson should all be factors. Oyster River is led by juniors Olivia Lenk, Lily Doody, and Madison Hoppler. BOYS: Four of NH’s top-ten ranked schools are coming: #4 Winnacunnet, #5 Oyster River, #8 Hanover, and #10 Trinity, which has emerged as a top contender to win Division 3 this year. Kingswood, Campbell, Sanborn, and Souhegan are all Meet of Champions qualifiers from a year ago. And of course Phillips Exeter Academy can compete with the best schools around. Merrimack Valley senior David Reynolds is the defending champ and course record holder. His twin brother Matt should be in the lead pack too. Tilton Prep is only sending one runner but he’s Patrick Guinee, who placed third overall in this meet a year ago. Campbell is led by Jeffrey Allen, the defending D-3 champion who finished fifth at Bobcat last year. Colin Donnelly, a New England qualifier last fall, is among Winnicunnet’s leaders. Oyster River is led by sophomores Owen Fleischer and Andy O’Brien. Sanborn’s top runners include Dylan Khalil and Owen Stocker. Milford’s Caleb Korthals qualified for the MOC as a freshman last fall. Danny Donovan (Trinity), Evan Coyne (ConVal), Thomas Heddington (Souhegan) look to be in or near that lead pack. Did you folks forget Monadnock??? I love your website. It allows me to watch my grandkids race ( the Reynolds family). I had hoped you were doing the Bobcat live, but apparently not. When will the races be posted? I live in Colorado, so this is my way to watch. Very difficult and expensive to pull off a livestream of cross country. Videos will be up very soon. Thanks for your patience.